We are in love with using a simple dot border for blankets! Yarn Over (YO), insert hook, YO, pull back through, YO, pull through two loops, *YO, insert hook into SAME space as before, YO, pull back through, YO pull through 2 loops. Repeat from * 3 more times. YO and pull through all 6 loops. 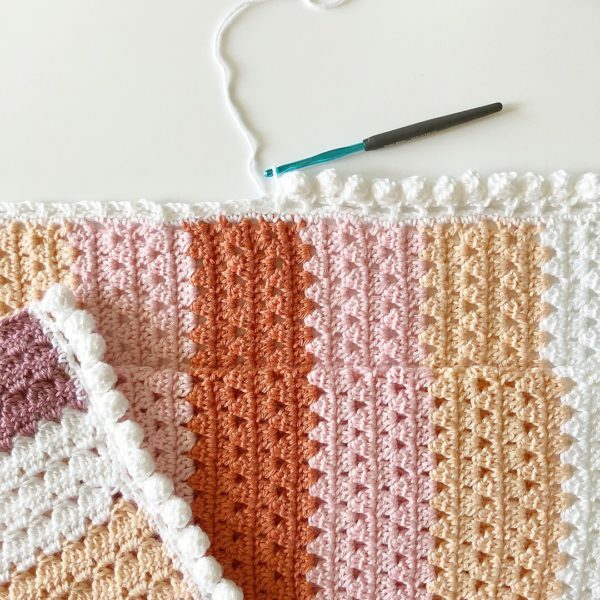 To work this border around any blanket, start with a round of any stitch, single crochet, half double crochet or double crochet. After completing the round, *chain 3, in the first of those chain 3’s, work DC5tog. Slip stitch (SLST) into the next 3 stitches (or however many you wish if you’d like the dots more spaced), repeat from the * and work around the entire blanket. You do not need to do anything special around the corners unless you need to possibly slip stitch one or two less if you feel the blanket pulling and puckering. Tap this photo to be taken to the pattern. video tutorial and pattern available by clicking this photo. Thanks for stopping by! We have lots more stitch tutorials here on the site if you are interested. It’s my favorite page to look through and get inspired for new projects. Feel free to use any of them for a project of your own! I look at stitches like ingredients in a recipe. They are free for anyone to combine and make beautiful items! I’ve found many classics and I love sharing them with you. If you are on Instagram, come find us @daisyfarmcrafts or find our stitch page there too! @daisyfarm.stitches.